Great stroller with lots of options. My son-in-law installed the base for the Keyfit 3 in my car so that I could take my new grandchild in the car, but I wanted to have a stroller to take her out when necessary. I found the Liteway Plus on the Chicco website. When I read the description it seemed perfect--and baby's parents could borrow it to use as a smaller stroller/carrier when they travel by air. I watched video reviews online, and although it was reviewed well, it was described as being complicated to change from stroller to car seat carrier. What bunk! There is nothing difficult about this stroller and it feels great to push. When the stroller arrived it needed a couple of wheels put on and the cup carrier, and then from what I had previously watched on the videos was easily able to change it from stroller to car seat carrier mode. It snaps right in, and you feel secure that the seat is on right. Yes, this is like an umbrella stroller where there are two separate handles, but they are nice and long and covered with grippy foam so that you are not bending over when you push; the spacing of the handles is very natural. The wheels are not tiny like an umbrella stroller, so the Liteway Plus gives a smooth ride. I leave the carriage near the front door, so that if baby is sleeping when she arrives, we can place the carrier in a very secure place, roll her to the family room and let her sleep. ProsWell constructed, front wheels can rotate or be fixed. Quiet, good performance wheels. Several positions for stroller seat. 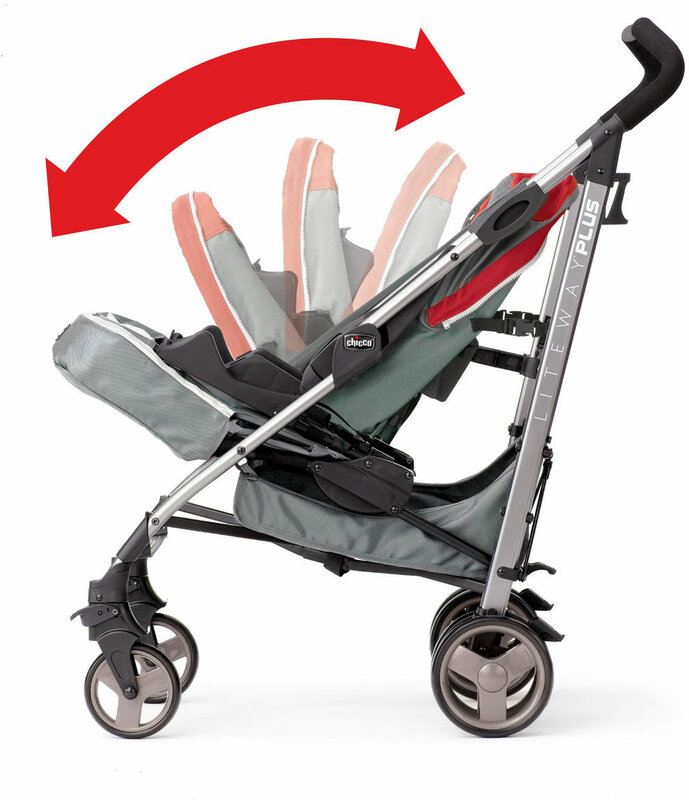 When used as a carrier, built in cover protects the stroller seat to keep it like new. Nice, long handles, well positioned. Easy to collapse and put in trunk. Carry handle. Takes up much less room in the trunk than the (really lovely) keyfit stroller that was part of the Keyfit 3 system. ConsThis is not a lightweight umbrella stroller--it has some weight to it which may be a con for some. 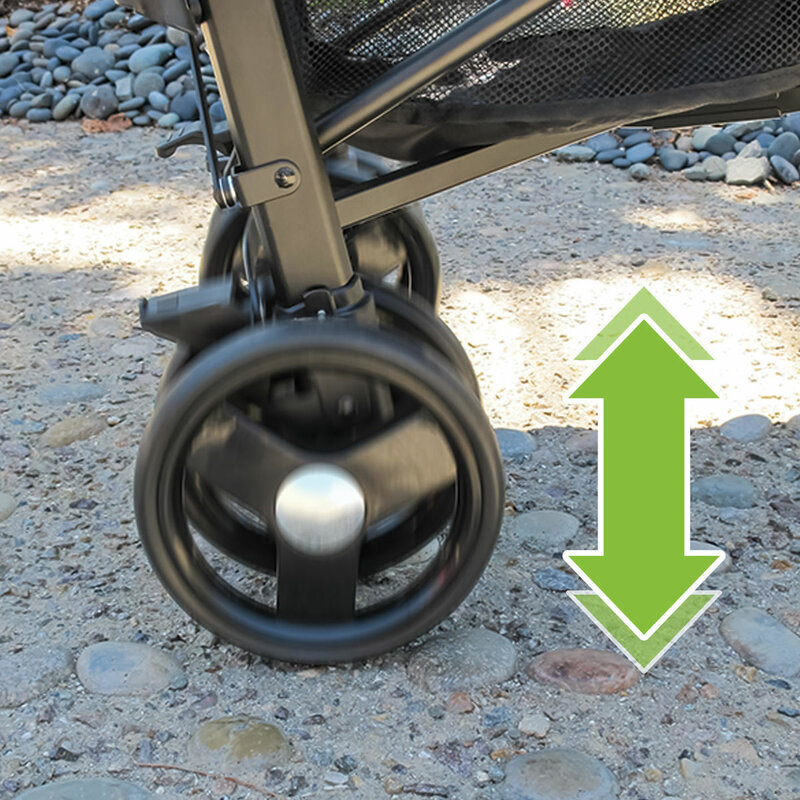 Best UsesAs a second stroller for the Keyfit 3 system, for travel or grandparents. Love the fact that its so different! Was really not too sure when looking online due to the pattern but when it arrived I loved it! If your looking for something simple but different this is the stroller to get! Love the fact that its light weight, not bulky and that I can place the car seat on top! Definitely something that I will use until my child is a toddler! This is a fantastic stroller. Took my grandson to a amusement park for the day. His car seat fit in the Liteway so I felt he was safe and secure yet I didnâ€™t have the weight and bulk of a full size stroller. It is also very easy to operate. I would highly recommend this stroller. Best UsesIt is a umbrella stroller but a whole lot more !! The height of the handles on this stroller are considerably higher then typical umbrella strollers. The ease of switching between the car seat and umbrella options is nice as well. I would recommend this stroller. ProsEase of use. Height. Weight. ConsDoes not fold as small as a typical umbrella. 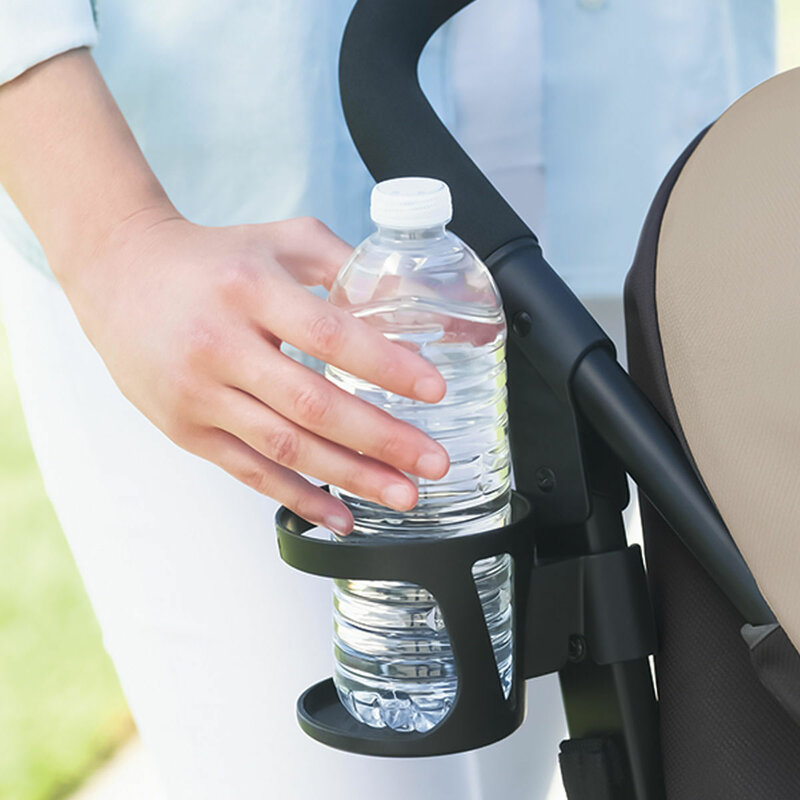 We love the functionality of the stroller. It is very sturdy. It is a bit heavy for an umbrella stroller but that is explained by it's 2 in 1 functionality. Perfect for flights due to slim design and a breeze for TSA checking. Additional feature if accepting Key-Fit car seat makes for transporting baby to car even easier. Very smooth steering and durable frame. I am so pleased with this purchase. The price was great, and shipping was fast. The stroller is exactly what I was looking for. It is easy to use, smooth to push, and is well made. So happy with this! Love the stroller and color. Easy to fold and unfold. I love that I can use it on my chicco car seat. I have had this stroller for over 4 years now and have used it constantly with 3 kids. It has been used and abused and still works great! Never had an issue with the wheels. This is mainly a stroller for smoother surfaces. We use it for sidewalks and shopping! Love that I can put in my infant car seat or my toddler. Very easy to use and we still love it to this day ! I bought this stroller to go with my Chicco Keyfit cafe seat which I love and to use when travelling. The stroller has been a nightmare from the beginning. The wheels are very difficult to turn, making it challenging when using alone, you cannot push this stroller with one hand and expect it to go in the right direction. It's very fragile and confined for use on smooth concrete. Not versatile, seems cheaply made compared to other Chicco products. I bought this stroller for my chicco key fit car seat. We went on a road trip to Seattle and down the coast. So we needed a compact stroller that wouldn't take up too much room. The car seat easily clicks in and out. Nothing fancy about this stroller. But it worked great for us. 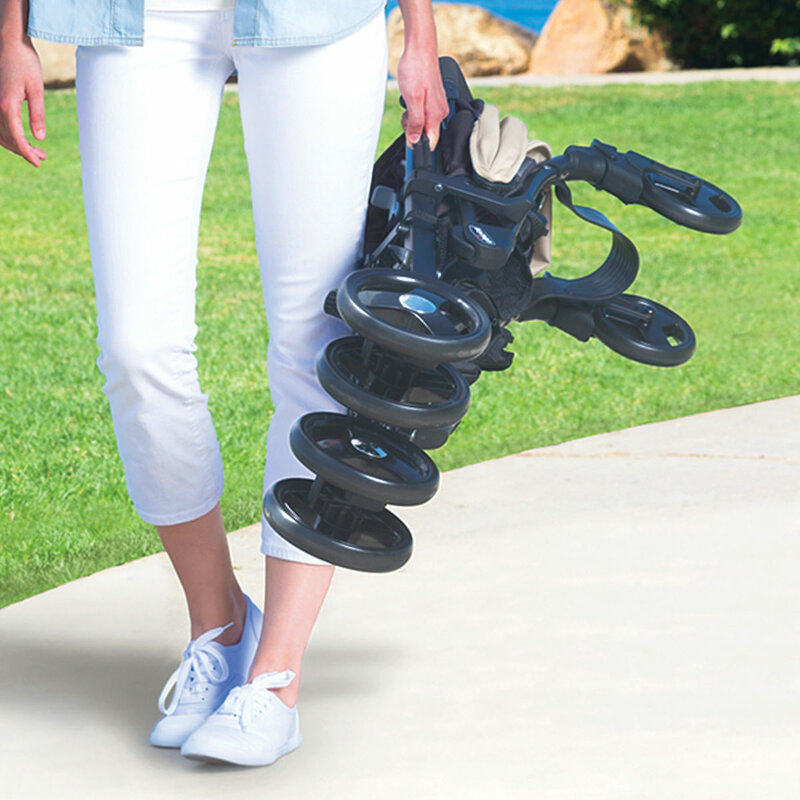 ConsThe wheels are not sturdy and get caught on any uneven pavement or pebbles on the sidewalk. The seat doesnâ€™t recline back very far. The sun shade is super short. We ended up having to lay a blanket over to give more shade. Best UsesQuick trips in and out of the mall. Front wheels could be greatly improved. I bought this stroller when my baby was 3 months old, now he has 10 months. This stroller has never worked, the front wheels are incredibly bad, they do not work, they lock constantly.Last week, I left my mom in the mall with the baby while i was doing a due diligence, i was surprised to get her frustrated in the same place where I left her and with much pain in her wrist because she made a big effort to be able to move the stroller beacause as the front wheels are locked again and again.Never buy this stroller brand again. I bought this stroller when my baby was 3 months old, now he has 10 months. This stroller has never worked, the front wheels are incredibly bad, they do not work, they lock constantly. Last week, I left my mom in the mall with the baby while i was doing a due diligence, i was surprised to get her frustrated in the same place where I left her and with much pain in her wrist because she made a big effort to be able to move the stroller beacause as the front wheels are locked again and again. Never buy this stroller brand again. Had it for my baby boy 4 years ago. Buying againg for my new baby girl! Very convenient! Easy to store. I've used this stroller a good bit in the 2 years I've owned it. I really liked the click in base for the infant seat and how it easily converts to a regular stroller. It's easy to push and the handles are great for throwing on shopping bags or your purse. I've used it more on errands than I ever did the first large Chicco travel system stroller (with my first child.) It folds and stores easily in the trunk of my sedan. The compact size made it more practical to use. Love this stroller! It's great to have an umbrella style folder that accommodates an infant seat. Easy to fold easy to maneuver, decently lightweight and has a parent cup holder. Highly recommend this stroller! I purchased the stroller and have used it For approximately three months and I have found that it is great on sidewalks and in stores. I like that it is easily foldable converts from holding the base of the car seat to a stroller easily. However, there is absolutely no way to push the stroller on the grass or on gravel for any distance. The front wheels could be greatly improved. I have had these stroller for four months for our baby and let me tell you I thought it was going to be great but the wheels are garbage. They did stuck all the time and it's so fustrating. I realize this is a stroller for rough terrain but it should be able to be pushed over short grass and it doesn't. The clicking in and out of the base part also almost never clicks in right. It's annoying to have to click your baby in and out until it is seated correctly. If you live where it's concrete only this may work better but don't plan on going to the park. I have had these stroller for four months for our baby and let me tell you I thought it was going to be great but the wheels are garbage. They did stuck all the time and it's so fustrating. I realize this is a stroller for rough terrain but it should be able to be pushed over short grass and it doesn't. The clicking in and out of the base part also almost never clicks in right. It's annoying to have to click your baby in and out until it is seated correctly. If you live where it's concrete only this may work better but don't plan on going to the park. I originally had a liteway 6 years ago I loved it so much I bought the liteway plus for my newborn. The plus is amazing with the option to put the infant seat attached. 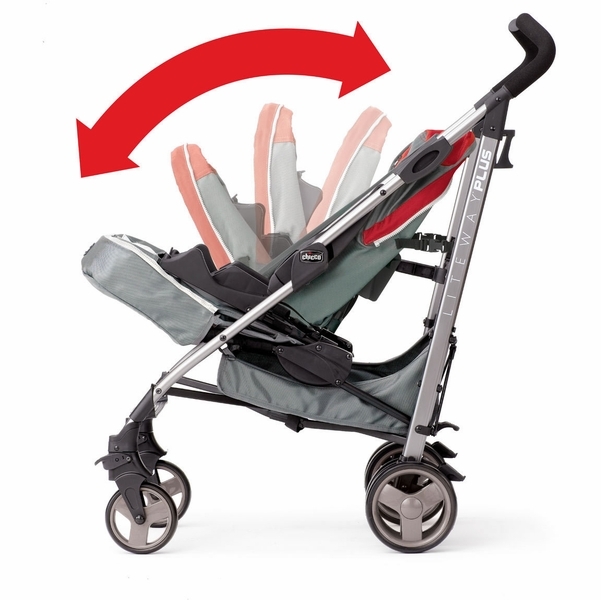 The stroller is light and compact and works wonderfully as the stroller I keep in my vehicle. Handles way better than cheapo umbrella strollers! I purchased this stroller about a month ago for my grandson to use when he is visiting. It lightweight and easy to open and close. Unfortunately I was extremely dissapointed with this stroller. The pin of the wheel broke off in the box without us knowing, before we used the stroller. We bought the stroller for our trip to nyc. The first time we opened it and used it in the city we noticed the wheel was broken which meant we were strollerless the entire trip. We had to carry the car seat around nyc. I wasn't impressed with the quality at all. We love the Chicco car seat and hoping that this stroller helps make it easier to take it places! I love using this "build your own travel system"; I use this with my Key Fit 30 carseat and it is so light and easy to use. Very convenient. I have had this stroller for 2 months and it is already giving me grief. I walk everyday (on paved sidewalks) about 2-3 miles with this stroller; going over a few curbs and some grass and it is already breaking down. The front wheel gets caught up on seemingly nothing or turns sideways and stops me in my tracks. Also the click in mechanism for the car seat is already starting to fail. It takes me a few tries now to get it to lock in place. Finally, the folding lock lever doesn't stay closed and it will fall open when lifting or carrying it. Very frustrating to say the least. However, there are some positives about this stroller. It is very compact and a good size for shopping. It is also well balanced and doesn't tip easily. I was looking for a compact, sturdy stroller that was light weight and would fold up nice in the back of my car. This was THEE perfect choice and trust me, I looked at a LOT of other options. 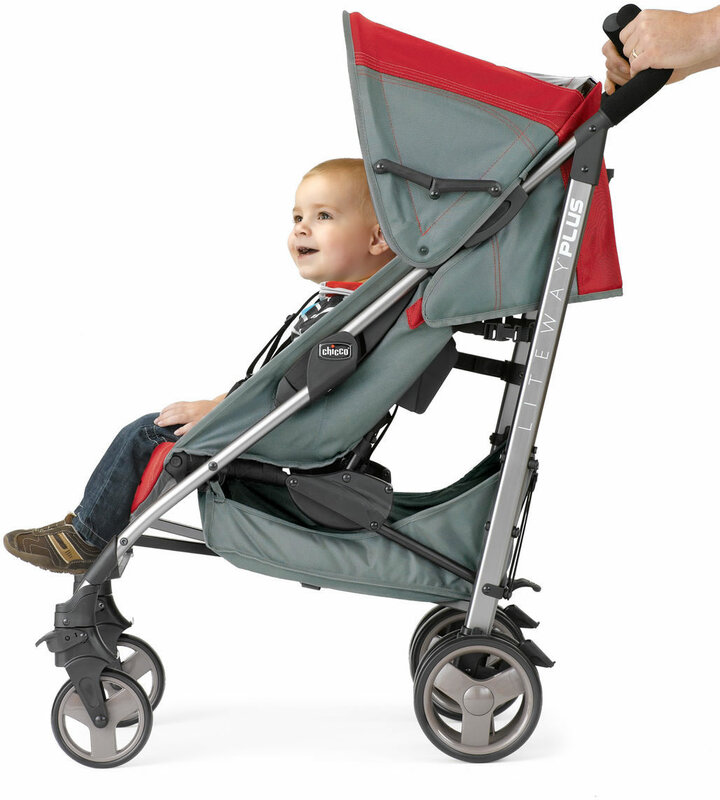 It's not like a typical light weight stroller, it's very durable and will last a long time. Totally worth the investment. Also fits the keyfit car seat which sealed the deal for me!! I appreciate that I was able to use this stroller as part of a travel system with the matching key fit 30. It's small, but it works as well as a full size stroller without the bulkiness. I got this stroller for my son because I liked the versitility of being able to use the car seat and having it be an umbrella stroller. However, the front wheels are TERRIBLE!!! We constantly have to lift it up on the rear wheels so the front ones can fall back into place. Such a pain! Does Chicco make replacement wheels for the front that are double? I love Chicco and everything else about this stroller, but will have to get rid of it if the front wheels aren't addressed. We got this stroller as part of the travel system with a Keyfit 30 Infant Seat because the infant seat would click into this stroller - I love it! This stroller is extremely lightweight and easy to stow in the trunk; easy to get out quickly for a mall shopping or doctor trip and folders quickly and easily. My son is now 7.5mths, 18lbs and 27" long and he fits perfectly into the stroller itself (sans the car seat). It is more of a space saving smaller stroller so the storage below does not hold a lot but it is not designed to do so. There are some complaints about tires - I personally have not had tire issues with my stroller; however, it is not an all terrain stroller; it is ideal with pavement and flat surface strolling - not rocks, stones, mud, etc. 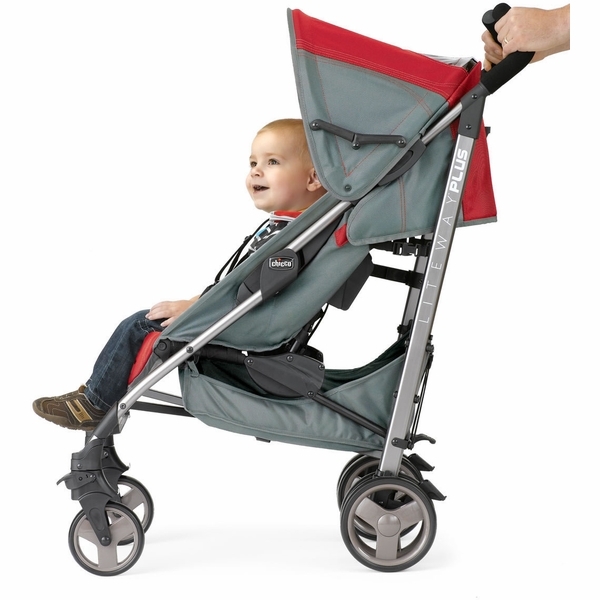 Overall, I love this stroller because of the lightweight and ease of use. Are you kidding me???? Why didn't I read these reviews before I bought this stroller? For some $179.99 is not a lot of money, for me it is!!! I now have a stroller I can't use because wheels decided not to go. It get stuck sideways and just does not move. REALLY REALLY HARD. Not to say one wheel never touches the ground. I have no idea how to fix it, can't return because it has been 1 1/2 year since I purchased. I'm just not done yet using it, so will probably have to buy another one. What it makes it even harder is the fact that the stroller itself is great. I love it. Useless wheel do not work!! I thought I was going to really like this stroller as second stroller to my Uppa Baby Vista. I cannot use this stroller as the front wheels are constantly getting stuck no matter surface I'm on. I have to phisically move the wheel in order for it push straight for 30 seconds before it happens again. Chico please fix this problem if you haven't already. I'm now looking for a different umbrella stroller. Also compared to the Liteway the handle bar fabric is gross I hate the feeling. The Liteway has a nice smooth material on the handles. Love this stroller. Much better then the normal big stroller that comes in a travel system. Highly recommend. We purchased this stroller to use with the Keyfit 30 infant car seat. We don't have much cargo space in our vehicle, so we didn't want to use it up with an enormous stroller. This stroller is perfect. It folds and unfolds easily, is light, and maneuvers easily. The infant seat snaps down securely and quickly. Wish I would have had something like this for my older children. Like to concept but wheels are terrible. I really like that it is compatible with the Key Fit car seat. It folds up nice and seems good quality. EXCEPT for the wheels! They seem to lock up, and its a little frustrating considering the price of this stroller. I see others have struggled with this is as well- the wheels need to be addressed. For all those that have a problem with the front wheels, I had the same issue and I solved it by putting some grease. Just remove the wheels and put some grease inside it should work. I purchased this stroller in January 2016 at babies r us. I only used it about twice a week on shopping trips, It worked fine up until two weeks ago. The tires completely locked up from the back and now I can't use it. Would be a 5 Star if not for the front wheels! I've had this stroller for approximately a year and a half. I bought it when I was pregnant with my third child. 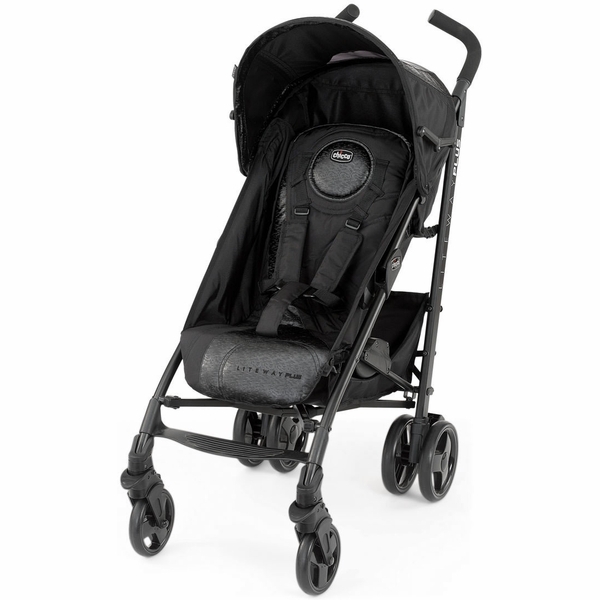 It was fabulous when I first bought it and loved that it was a smaller/lightweight travel system. When the stroller was about a year old, the front wheels started acting up and now they are absolutely terrible! They constantly lock up in place and do not turn . . . I've taken it on walks around the neighborhood and have had to actually carry the entire stroller across the street when the wheels have locked three steps across and a car is waiting to go. Chicco needs to address this issue or scrap this model completely. Used this stroller for both kids overall love it. It is a little tricky to fold up but easily learned... bad for grandparents and babysitters though! Front wheels are awful! Very disappointed. I've only had this stroller for 6 months and I'm having so many issues with the front wheels. 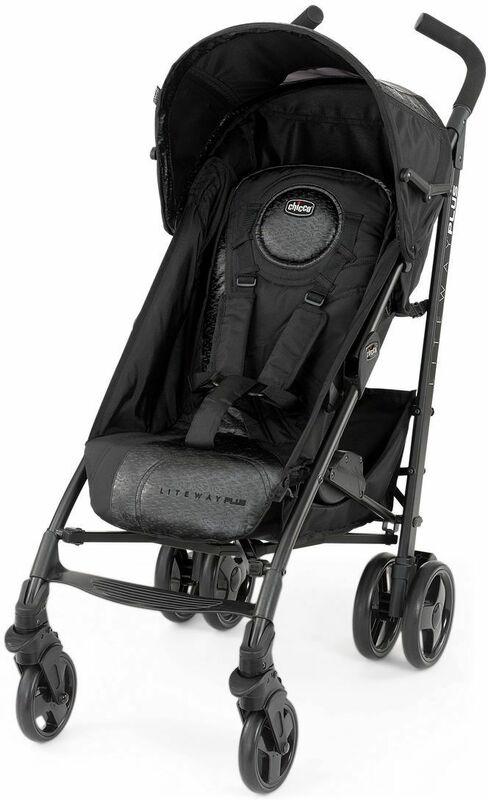 We mostly use the jogging stroller so haven't put many miles on this Liteway Plus stroller. It worked well the first couple times we used it but now, the front wheels constantly turn sideways and lock-up, preventing you from going forward, even when you are not even turning the stroller. We have also had some issues getting the infant car seat to lock in this stroller. Sometimes you can feel the click but most of the time you cannot. So, we have to try multiple times to get it to lock securely. We are looking into warranty information now so that we can send it back. Not worth the headache. It seems like multiple people have been having these issues, so Chicco really needs to address it. Awesome price and great stroller. My daughter is 3, and we wore out her previous Chicco umbrella stroller. This stroller has a higher weight limit of 50lbs. It is very sturdy and easy to carry. I would recommend this to everyone. Positive: I have owned this stroller for over a 1 1/2 years now with our first child. I love the versatility of the stroller. When my daughter was 7 months it was so easy to change from car-seat mode to her able to sit up right in it. Great feature when your running errands and you child goes from sleeping between drives to wide awake and want to see the world. Negative: Two features that need to be worked on. 1) Sun Bonnet on the top. It never really stays where you need it. I really needs another section of fabric to really block the sun. I just put a blanket over it. 2) For some reason the front wheels even when we first purchased it get jammed. This seems to be an off/on problem with other owners. Overall: Excellent stroller. I would purchase it again. This stroller is so much less bulky than my original Chicco stroller and very light weight. I have not experienced any wheel problems! Very easy to handle. I am very pleased with this purchase! I have owner a lot of strollers in my lifetime and I wanted a less expensive umbrella style folding stroller that looked good and functioned well for my toddler. I really think this fits the bill. I'm pregnant with my 6th baby now and I plan to use it by clipping the infant carseat into it as needed. For the price, I would absolutely recommend this stroller. The only negative is that the wheels can be slightly stubborn at times and don't turn smoothly all the time, but it's really not a big deal for the price especially. Lightweight with a compact 3D fold and included carry handle, the Liteway® Plus is designed for easy travel. For a quick and easy transition from the car to the stroller, the Liteway® Plus seat folds forward to accept the KeyFit® with a simple, audible click so that you know the carrier is secure. And when you no longer need to keep baby in the car seat, you’ll love the adjustability of the stroller with five recline positions, adjustable leg support, a zip-off rear-panel and removable canopy for maximum comfort and convenience. Take your Chicco Liteway® Plus Stroller – Fusion with you wherever you travel. It’s built for use from the time baby is born until baby is 50 pounds. Dimensions – Open: 35L x 40H x 19W in. Dimensions – Folded: 46 x 12 x 11.75 in.